Mutant Abilities: Uncertain at the moment, but appears to have unique body chemistry that allows him great durability. That same chemistry allows him to absorb mutant DNA and manifest mutant powers to an extent that is not yet known. History: Nathanial Essex’s life is as nefarious as his codename would imply. His history is quite extensive, so much so that it’s not entirely clear how old he is or when he was born. It is almost certain that he is over 100 years old. It is also certain that he grew up in Sussex, England around the turn of the century. Not much is known about his family other than his father being a respected naturalist in his time. He was a well-known and highly regarded contemporary of Charles Darwin. However, he failed to gain much notoriety. This was largely due to the widespread rejection of his theories that often took evolution much further than Darwin had hypothesized. Most of his work was lost, but at some point along the way Nathanial Essex picked up where his father left off. Whether by legacy or desire, Nathanial Essex demonstrated uncanny brilliance at a young age. He skipped several grades and enrolled in Cambridge University at the age of 17. He quickly made a name for himself as a foremost authority on biology and genetics, which were still in their infancy at this time. He was also one of the few academics to pay attention to mutants, who were small number and poorly understood. Many of his theories were ahead of their time and as a result he had great difficulty convincing others of his theories. As he became more obsessed with mutation, he was written off as an eccentric and quickly lost favor within the academic community. This rejection pushed him further to the fringes of his field where he became increasingly reclusive. After graduating with several PHDs to his name, Dr. Essex accepted a teaching position at Cambridge that he ended up holding for many years. In between his lectures, he continued conducting experiments to test his theories. These experiments were often bizarre and involved obtaining samples from various humans and suspected mutants, sometimes by force. This led to his eventual dismissal from the university. Despite this rejection, he remained determined to further his research. Around this time, World War II had begun. He believed he could find someone to fund his research if he could prove it had value to the war effort. At around this time, Dr. Nathanial Essex’s life took a strange and mysterious turn. At some point during this period, he made contact with an alien from the Shi’ar Empire. This creature was a psychic named Oracle, who for reasons unknown decided to hide on Earth. Apparently, she had also been wounded and needed assistance. When she found Dr. Essex, she shared with him the advanced knowledge of Shi’ar science in hopes that he could heal her. While it didn’t help Dr. Essex save her life, it imparted on him a dangerous level of knowledge that he believed vindicated both his ideas and those of his father. Armed with this new knowledge, he utilized the alien technology given to him by Oracle to conduct an experiment on himself. This changed his biology and his true physical form into the pale white complexion that is so distinctive. It was through this process that Dr. Nathanial Essex died and Mr. Sinister was born. While his new form was durable and allowed him a new range of abilities, he could still take the shape of his human form. He would have to because the new knowledge he had made him a more valuable asset. Around this time he began gaining interest from various benefactors. Who these benefactors were isn’t known, but the resourced they provided allowed him to re-establish himself as a prominent figure in the emerging field of biotechnology. After World War II ended, Major John Wraith and Dr. Abraham Cornelius began the Weapon X program. At first, they resisted allowing Sinister to become involved because they saw him as too eccentric and unstable. But after demonstrating his advanced knowledge of biology, they allowed him to assist their efforts. From early on, there was widespread suspicion about Sinister. As a means of protecting himself, he enlisted help from Colonel Phillip Summers, grandfather to Scott and Alex Summers, to help keep Weapon X at bay. Colonel Summers was a staunch critic of Weapon X and worked tirelessly to shut it down. While he was unable to stop Wraith and Cornelius from developing this infamous project, he was a vital ally for Sinister when the time came to betray Weapon X. After years of contributing his brilliance to Weapon X, Sinister formulated an elaborate plot that would destroy the program. He purposefully miscalculated several vital parameters for the final experiment that would have solidified Weapon X’s control over Wolverine and Sabretooth. This led to the devastating breakout that not only destroyed much of their work. It allowed Colonel Phillip Summers to permanently sever the ties between the government and Weapon X. While much of Weapon X was in ruin, Sinister managed to escape with a wealth of vital and illegal research. Armed with this research, he continued his work on his own terms. In the years following the destruction of Weapon X, Sinister utterly disappeared from every record. It is believed he solidified a relationship with an unknown benefactor that provided both funding and resources for his experiments. This allowed him to continue his work in secret for years. 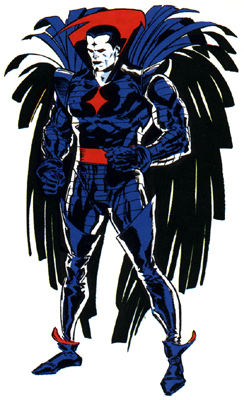 It is believed that Sinister was largely biding his time, preparing for when mutants would become a more prominent issue. As his research reached several important thresholds, he recruited his own team of mutants known as the Marauders. Most of these mutants were criminals or orphans that he helped enhance using his Weapon X experience. Among them were Madelyn Pryor and Gabriel Summers, two mutants with strong personal ties that came to see him as a godfather of sorts. With their collective efforts, Sinister continues to push forward with his research. It is still not clear what the end result of his research may be. It is believed that he wishes to create the ultimate mutant as a means of accelerating evolution. As his work grows more ambitious, he has faced opposition from the X-men. While they have delayed certain aspects of his work, he remains undaunted and continues to move forward towards an unknown and presumably sinister goal. Character Breakdown: Sinister’s psychology defies a great many norms, so much so that it’s difficult to accurately assess him. He demonstrates a very cold and calculating mindset, ignoring even the most basic of ethics when it comes to dealing with people and conducting experiments. This hints that a significant aspect of his persona is built around the extensive dehumanization of the world around him. He doesn’t see others as individuals. He sees them as a mere collection of flesh, making it easy for him to inflict pain and torment without remorse. This dehumanized standard isn’t applied to himself or his Marauders. He sets mutants apart as having more inherent value because of his power and his brilliance. It is a common trait among those of high intellect and a low regard for humanity. While he seems to place a larger value on mutants, that value stems mostly from their genetic potential. Despite Sinister’s exceedingly low regard for human life, he clearly does not see his actions as evil. He always finds a way to justify his actions through either cold logic or some twisted sense of morality that seems to stem from an aversion to flaws. While he seems to hold evolution in high regard, he also seems to despise the mechanisms that fuel it. He seems repulsed by the idea that evolution requires so much death and so much time in order for life to progress. It may even be the case that he is genuinely repulsed by the suffering that life must endure for this progress. It helps to further justify the infliction of suffering because in his mind he’s only sparing life greater suffering in the long term. Because of this twisted morality, it is hard to call his personality one of narcissism or that of a messiah complex. He believes that what he is doing is best and does not seem fueled emotional factors such as fear, hatred, or vengeance. Along with this aversion to the flaws of life, Sinister also demonstrates an exceedingly objectivist point of view. He is very strict in identifying what is true and what is false. There is very little room for ambiguity. This plays into his cold and calculating demeanor, leaving little room for emotion or subjective understanding. While it’s clear he’s not emotionally stoic, he seems to compartmentalize any emotion he feels and largely disregards any that he does not deem useful. This makes it difficult for him to feel empathy on any level while still allowing him to take advantage of others who do. His utter disregard for ethics and humanity in addition to his undeiable brilliance make him dangerous in a way that cannot be understated.